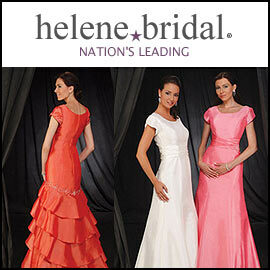 China-based HeleneBridal offers a collection of understated and elegant modest prom dresses. Many of the dresses are available in a broad range of colors, from soft pastels to bright colors like lime green, burnt orange and watermelon. You'll find floor-length chiffon gowns, A-line square cuts, and silk-like satin dresses. A separate search on the site for bridesmaid dresses may also reveal some conservative dresses that would be suitable for prom. At the time of our visit to the site, prices for modest prom dresses ranged from $99. to about $159.99. The company also offers accessories such as bolero jackets and tiaras. To navigate to the modest prom dress section, choose "Prom" in the top horizontal navigation, then in the left-side "Style" section, scroll down until you see "Modest."